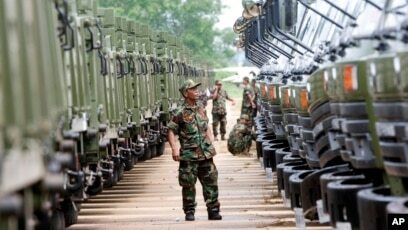 FILE PHOTO – A Cambodian army soldier looks at Chinese military vehicles displayed before a handover ceremony at a military airbase in Phnom Penh, Cambodia, Wednesday, June 23, 2010. The United States’ top intelligence official has said Washington is wary of a possible Chinese military presence in Cambodia. In its annual report, the office of the director of national intelligence, Dan Coats, said the return to a de facto one-party state after the last elections could lead to greater Chinese influence. Last week’s declaration by Cambodian Prime Minister Hun Sen calling for the armed forces, led by his son Hun Manet, to “destroy” the already outlawed opposition confirms what many had feared, even as the international community and the United Nations have been generously silent on Hun Sen’s violent words, which have often been translated into lethal action. It was just a couple of months ago that Hun Sen “promoted” Hun Manet, his eldest son, through a so-called royal decree as chief of the joint staff of the Royal Cambodian Armed Forces and commander of the army’s infantry headquarters, and reportedly as a possible successor to the premiership. These threats coupled with Hun Manet’s willingness to comply with his father’s dictatorship raise serious questions about whether Cambodian students ought to be granted special scholarships to study in the West. Cambodia’s heir apparent is not reluctant to follow the path of his father’s dictatorial leadership, even if it means using the armed forces to lock up and kill critics or political opponents. Despite Manet’s Western qualifications, his decision to sustain Hun Sen’s dictatorship is certain to solidify. If a US Military Academy graduate like Manet, also holder of a doctorate from the University of Bristol in the UK, is willing to be a top figure in his father’s regime, the question is, should the West be a breeding ground for Cambodia’s dictators-in-waiting? Had the UN condemned Hun Sen’s latest threat, it would have sent a strong message to Manet that the international community will not tolerate the lessons that his father taught Cambodia’s dictator-in-waiting. 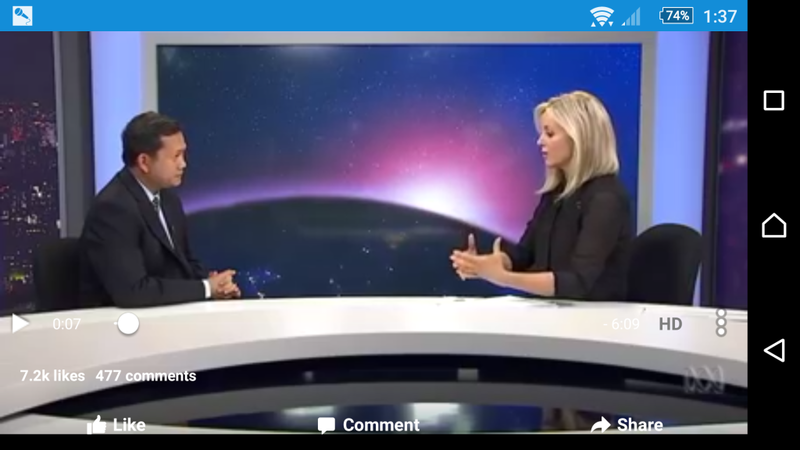 Failing that, Cambodia will continue to be subjected to generational dictatorship. The scale of suffering is no different to that of the former regime of Pol Pot. As Cambodia has transformed from a state of decaying democracy to a totalitarian state, Hun Manet is the product of his father’s regime – legitimized by the UN and the international community. 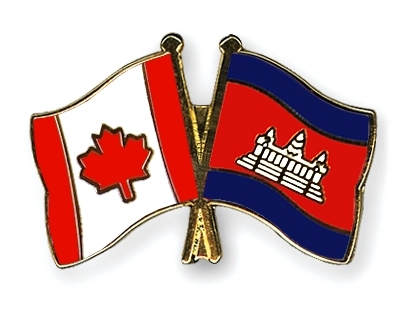 The promotion and protection of human rights, democracy and the rule of law have been integral parts of Canada’s bilateral relations with Cambodia. 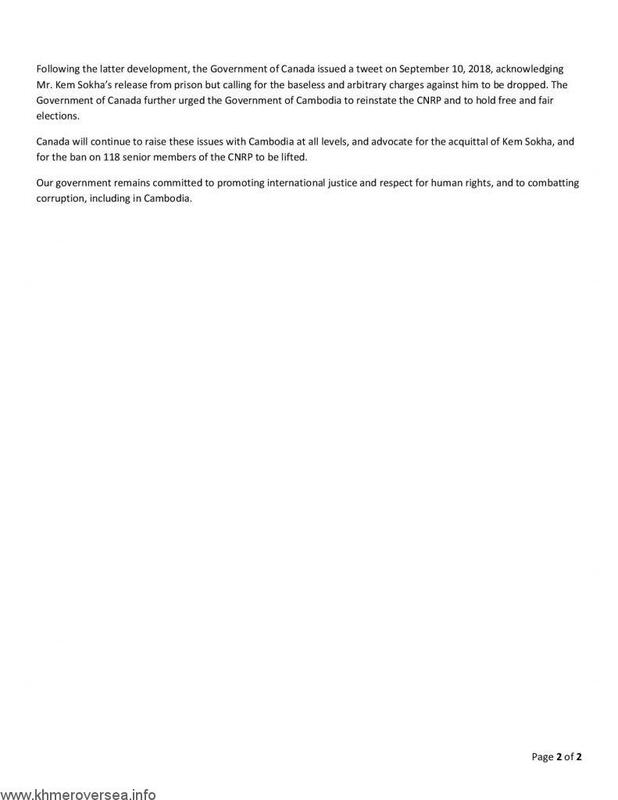 Canada is deeply concerned by the anti-democratic actions taken by the Government of Cambodia. The November 2017 dissolution of the Cambodia National Rescue Party (CNRP) by the Supreme Court and the arrest of its leader are deliberate attempts to limit alternate political views, and the targeting of media and NGOs are signs of the government’s growing disregard for the democratic process. 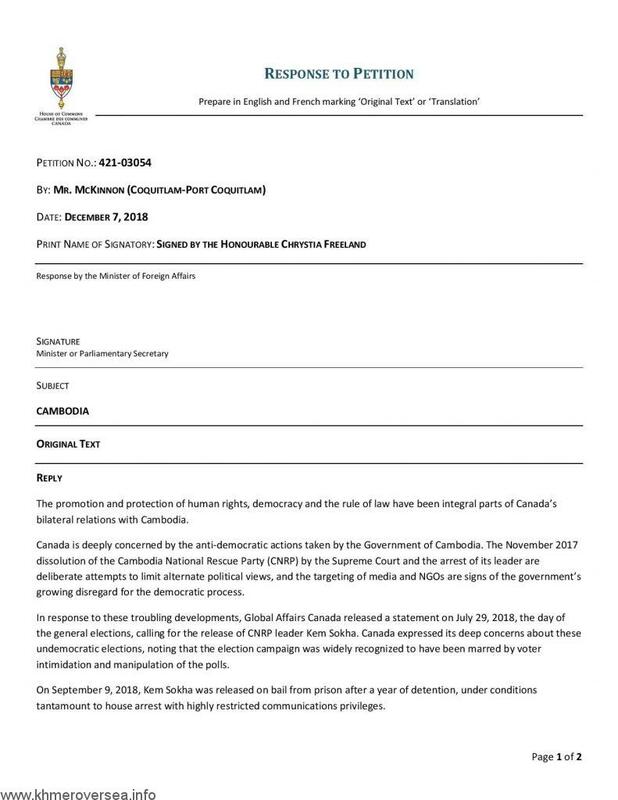 In response to these troubling developments, Global Affairs Canada released a statement on July 29, 2018, the day of the general elections, calling for the release of CNRP leader Kem Sokha. Canada expressed its deep concerns about these undemocratic elections, noting that the election campaign was widely recognized to have been marred by voter intimidation and manipulation of the polls. On September 9, 2018, Kem Sokha was released on bail from prison after a year of detention, under conditions tantamount to house arrest with highly restricted communications privileges. Page 2 of 2 Following the latter development, the Government of Canada issued a tweet on September 10, 2018, acknowledging Mr. Kem Sokha’s release from prison but calling for the baseless and arbitrary charges against him to be dropped. The Government of Canada further urged the Government of Cambodia to reinstate the CNRP and to hold free and fair elections. Canada will continue to raise these issues with Cambodia at all levels, and advocate for the acquittal of Kem Sokha, and for the ban on 118 senior members of the CNRP to be lifted. Our government remains committed to promoting international justice and respect for human rights, and to combatting corruption, including in Cambodia. PHNOM PENH, Cambodia — First came the 8,900-pound sticky-rice cake, stuffed with mung beans and pork belly, displayed at Angkor Wat and heralded as “officially amazing” by Guinness World Records. Then, in rapid succession, came a series of record-setting feats: The largest-ever performance of Madison dancing, with 2,015 participants. 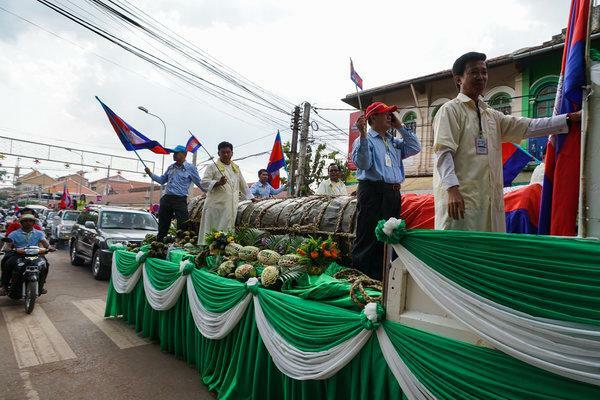 The world’s longest scarf (3,772 feet), woven over the course of six months and paraded through the streets of Phnom Penh, the Cambodian capital. And in November, the world’s longest dragon boat (286 feet) was launched into the Mekong River and rowed by 179 oarsmen. While this streak of oddball achievements might seem unconnected, they are all part of Prime Minister Hun Sen’s push to get young people excited about his aging regime, which he appears to consider essential to maintaining his grip on power. “The government’s intentions here are rather transparent: They want to create images of visible enthusiasm for the nation and its leadership,” said Katrin Travouillon, a scholar of Cambodian politics at Australian National University. 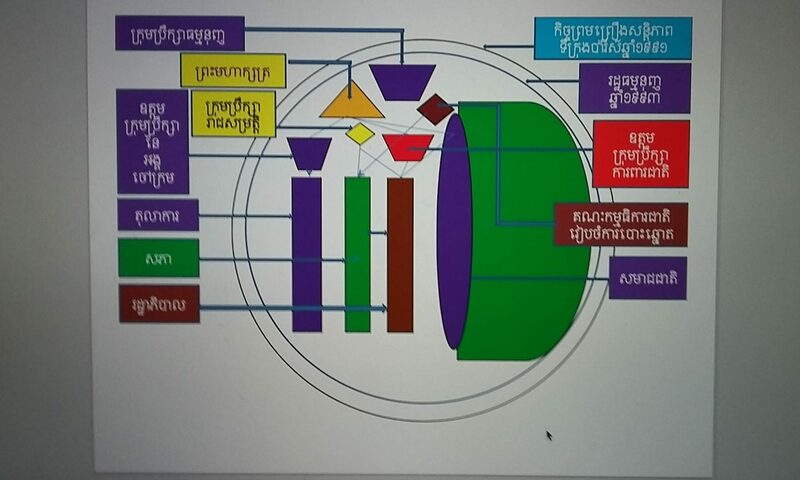 The initial salvo in this campaign was the rice-and-pork colossus, unveiled at Angkor Wat in 2015, and touted as a modern-day marvel by the authoritarian Mr. Hun Sen, now 66, and his son Hun Many, 36, who hatched the idea as a showcase project for his new pro-government youth group. Crowds cheered as a representative from Guinness World Records certified that the rice cake would take its place in the record book alongside Angkor Wat, the world’s largest religious structure and a source of enduring national pride. “I am proud to be a child of Cambodia, and today we have achieved a giant sticky-rice cake, and the world will acknowledge that from now on,” Mr. Hun Many said in a triumphant speech at the event. Two-thirds of Cambodia’s population is under 30, with no memory of the Khmer Rouge’s bloody rule in the 1970s, or the long years of civil war that followed. Many are weary of their country’s international reputation for genocide and political dysfunction. So the country’s youth are less susceptible to Mr. Hun Sen’s traditional message that his party’s leaders are national heroes, deserving perpetual legitimacy because of the role they played helping to oust the Khmer Rouge from power in 1979. The point was driven home to Mr. Hun Sen in emphatic fashion in 2013, after a near loss to an insurgent political party in an election that year. He has spent the past half-decade ramping up his efforts to appeal to the nation’s youth. “The C.P.P. has to have recognized by now that a national identity forged on victimhood and gratitude is difficult to reconcile with the ideas and aspirations of the younger generation,” said Ms. Travouillon, referring to the ruling Cambodian People’s Party. The new narrative emphasizes self-sufficiency and national pride, with Mr. Hun Sen publicly thumbing his nose at the Western donors who have poured billions of dollars of aid into the country. A critical plank of this project has been a revival of the country’s youth corps, headed by Mr. Hun Sen’s youngest and most affable son, Mr. Hun Many. Officially, it is nonpartisan; in practice, its activities support the ruling party. At a gathering of the youth corps in November, Mr. Hun Many urged participants to continue garnering world records. 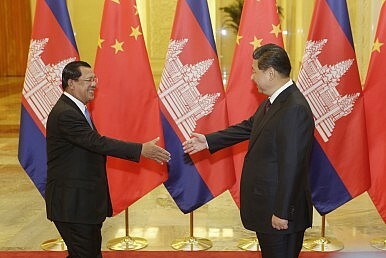 Has new war between US and China in Cambodia reignited again?